THE arrival of another giant vessel, the Petrojarl Cidade de Rio Das Ostras, in the port of Walvis Bay late last week have laid down a challenge for the local marine engineering and maintenance industry. 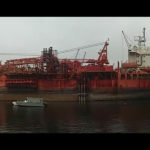 The floating production, storage and take off platform in the fleet of leading energy transport company Teekay is currently alongside at Namdock. An assessment is underway to find out what repairs needs to be done as well as to find out if the local industry has the necessary capacity to affect some of much needed repairs. The Petrojarl Cidade de Rio Das Ostras has until November last year been under contract to extract and store heavy crude oil for Petrobras in its Brazilian offshore oil fields. It is the second such a huge piece of equipment to dock in Walvis in as many months and has the potential to inject much needed revenue into the marine industrial complex of Walvis Bay. The huge SKD Jaya rig arrived in the first week of March and it was transported on the deck of the semi-submersible heavy-lift vessel, the Hua Hai Long from the Gulf of Paria. The rig has been ‘cold stacked’ in the Gulf of Paria, which is offshore of Trinidad since 2016. Cold stacking involves the partial decommissioning of a vessel when it appears that it will not be in use for an extended period of time. However, as vessels deteriorate due to the impact of sea water and weather, returning them to full working condition is a fairly lengthy and involved procedure.